Commercial quality beer bottle caps to keep your brew safe and sound from bottling day until you're ready to enjoy it. 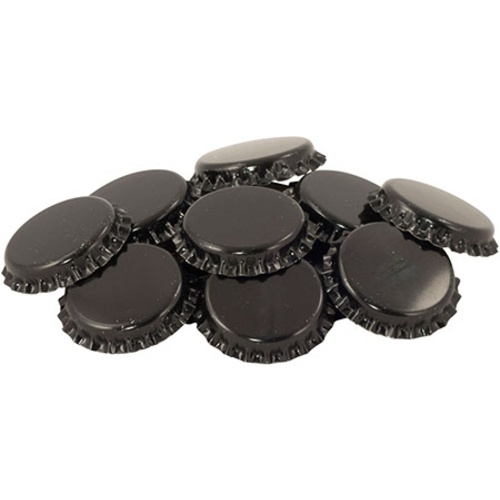 You will get a good firm seal that will last through transport, gift giving, and storage with these black bottle caps. These bottle caps crimp down onto the beer bottle and make a firm seal. They don’t rust or leak and they contain an Oxygen absorbing agent in the liner, which means you won’t get any unwanted oxidation. A good value for a great product. gotta have a cap for that bottle, right? Black caps for black beer! has anyone had issues with these considering you can't sanitize them? anything the beer touches i prefer to be sanitized. BEST ANSWER: It is OK to sanitize these caps but we recommend only sanitizing as many caps as you'll need on bottling day. The oxygen-absorbing agent in the cap liner is activated when wet. If unused sanitized caps are saved for later use, they will still function as a normal cap, but their ability to absorb oxygen may be depleted. I always soak my caps in sanitizer just before capping. No issue there. I did have an issue with the black caps (only the black caps) where I had a abnormal amount of flat bottles. Several per case. It could have been due to sanitizer residue on the mouth of the bottle. Now it wipe the mouth with a paper towel soaked in sanitizer as I cap to insure a good seal. Local brew shop no longer carries so very happy to find at a great price!